Offer people simple tools to make their offers and wants known. In this way they can make their presence known in the ‘marketplace’ that LETS provides. Offer people simple ways to search the marketplace for people who want what they offer, and for people who offer things they want. Offer simple, secure and reliable ways for people to transfer units of the LETS currency to each other. Keep a central, reliable record of all transactions. If you have a system that does all these things, then you have a LETS Scheme. Of course, you will want a system that makes all these things as simple to do and reliable as possible. QUESTION: But why would you go to the trouble of setting up some whole new system? Isn’t it easier to use normal money? The simple answer to this question is: ‘yes’ – but ONLY if you have easy access to enough money. LETS is most useful in places and for people who find it difficult to get access to enough money to get what they need. Although I would argue strongly that the idea of participating in a diverse currency economy is a Good Idea for everyone – as these can give you alternatives at times of economic crisis. As different currencies have different structural characteristics, it is less likely that they will fail at the same time. QUESTION: so the title mentions Feature Phones. What’s that about? There are online versions of LETS schemes that work fine if you have easy access to the internet and a decent smartphone. But people who have those often have access to money, too. This is about building an easy-to-use LETS platform for people who only have feature phones and 2G mobile signal – the way that M-PESA makes phone banking work in these circumstances. Let’s explore how that could work. First, someone needs to set up a ‘marketplace’. This isn’t a real marketplace of course – it’s a named link that identifies the marketplace, that anyone who wants to trade in it can use. This probably would be best set up from a laptop – but no-one else using the system needs anything but a feature phone. Then they need to get people to join the marketplace – simply, they need to tell people (any way that works) to send a simple message from their ‘phone to that marketplace, to start the joining process. They can join with their real name, or with a ‘trading name’. This means that they don’t have to use their real name where strangers could see it – a benefit in some situations. Once people have joined (they will send and receive a few messages, to make sure they really meant to join, and that their ‘phone is working), then they can send messages to advertise their wants and their needs on the marketplace. This is done with simple text messages. Then, people can send other simple messages to search the marketplace. The system will send messages back to tell them if it finds any matching offers or wants. If someone finds a matching trader, they can send a message to discuss the trade. It is important to say that so far, you can do everything without using real names. Nothing at this stage is binding, either – you can bargain all you like. Assuming a deal can be made – and everything so far is just talk – you need to arrange the terms of the deal. Usually this will involve meeting face-to-face – this will almost always be important, but isn’t technically necessary. When you meet to make the deal, first, check the terms of the deal are still acceptable to both parties. Then do the deal. Then arrange payment. The person who is paying LETS currency sends a message from their phone, with a short description of the deal, and the agreed amount. The person accepting the LETS currency will then receive a confirmation message, and they reply to accept it. That’s it. The system will record the deal, and move the amount of units of currency from the payer’s account to that of the payee, and update their balances. Job done. Both payer and payee will receive confirmation messages, and a separate message reminding them to edit their offer/want entry if it has changed as a result of the deal. QUESTION: OK – sounds simple enough. But where does this currency come from? That’s one of the great things about LETS. LETS doesn’t care about where it comes from. For LETS, currency is just information. It’s like money, yes – but with different rules. ‘Hard’ currencies are set up so that the person that makes the money is in control – it all comes from them, and if you want any of it, you have to do something for them – either work for them, or borrow it from them and pay interest. LETS currency doesn’t work like that. LETS currency is created by the marketplace, for the marketplace. All you have to do to get LETS currency is join the marketplace. Different marketplaces can set their own rules, but usually, you will start off with a positive balance in your account. Not an enormous amount, but enough to get you started. Go ahead – get something you need from the marketplace! QUESTION: Wow! That sounds too good to be true! Can that really work? Yes it can and it does work – LETS schemes have been working all over the world in different forms for 30 years. There are community versions and big business versions. If the marketplace is busy, then people use it, and they can easily find people to trade with – so they find the currency valuable and keep using it. If the marketplace doesn’t work well, then they quickly stop using it, and the currency stops being worth much. The rule is to keep spending your LETS currency. That way, no matter what happens, you won’t lose anything. QUESTION: But isn’t the aim with money to save it up? Why do you say that with LETS I should always spend it? What will happen if I get sick and can’t earn money – how will I use LETS then? This is a really important question, with a few surprising answers. It gets to the heart of why LETS schemes work well. Answer One: You don’t save LETS up because LETS marketplaces are much smaller than the hard currency marketplace. It’s too risky to save LETS currency. If a local problem happens, the marketplace could shut down and your big currency balance would be worthless. Answer Two: The only time any money actually does anyone any good is when it changes hands – the rest of the time it does nothing at all. so holding on to LETS currency is not in your best interest – or in the best interests of the community. Go ahead and spend it! Answer Three:You don’t save LETS currency because there are no interest rates – you don’t earn money on your balance, as you might if you have money in the bank. Answer Four: You don’t save LETS money because there’s no problem if your account goes negative. That’s right – there is no such thing as going into the red! (NB: different schemes have different policies – some schemes may outlaw negative balances) First – there’s no interest, so your negative balance doesn’t get worse. And second, there’s no bank to chase you for the money. Your negative balance indicates a commitment to the community to provide the goods and services you offer in the future to make good. If you’re sick, then it may take a little while, but you are trusted. QUESTION: Trust! But how do I know I can trust the other people in the marketplace? Especially as you say that people don’t have to use their real names! What if someone goes very far negative and then leaves the marketplace? Another important question. Again with more than one answer. Answer One: You can trust people in the marketplace because the currency they earn in the marketplace is only any use within the marketplace – they can’t spend it anywhere else. If they get a bad reputation in the marketplace, no-one will trade with them. Answer Two: Although you can spend LETS currency even if your balance is negative, there are limits. The system will set a maximum negative limit for each user, which will depend on many things – particularly on the size and turnover of the marketplace and the user’s history. If the user has special circumstances – like an injury, or family trouble, then other users support them by trading with them without asking for much to top up their account. So no-one goes too far negative. Answer Three: If someone borrows ‘hard’ money from you and then runs away, then of course you have a problem. But if someone has a negative at the LETS marketplace and runs away, no-one actually loses anything. Everyone who has been paid still has their units. Everyone carries on as before. Arguably the community as a whole has ‘lost’ something – but because the size of negative balances is not allowed to get too big, the system absorbs the negative without anyone suffering directly. 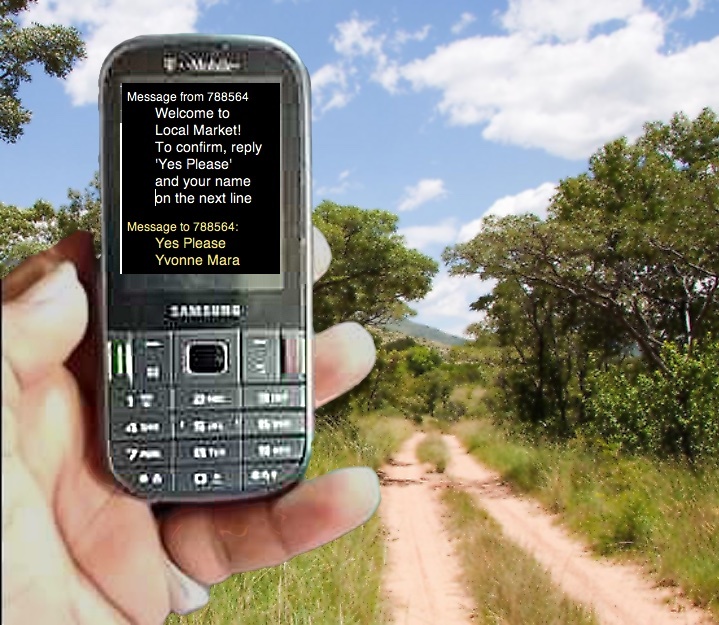 The following is a sequence of imagined messages to show how a marketplace could be navigated with simple text messages. Note that the ‘search’ function requires a reasonably sophisticated engine at the server end, identifying with a wide sweep, to work well with minimum typing at the client end. Previous Post Progressive Ethics Project – Launched!